Ambient Audio Visual is a Cheshire-based audio visual installation and events company. 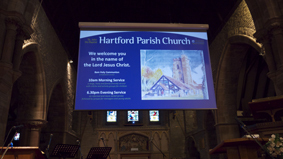 Challenge: St John the Baptist Church in Hartford, Cheshire needed to replace its old projector and heavy Perspex screen. It wanted a solution that was visually discreet when not in use and projected brighter, clearer imagery. It also had to adhere to the Church of England’s strict rules for installation. Solution: Ambient Audio Visual selected Optoma’s EW865 projector due to its high resolution (WXGA), high brightness (6,000 lumens), motorised lens shift, its ability to operate 360˚ and its reliability. This was combined with the BX-CTA03 long throw lens. A two-stage motorised rear projection screen was installed which lowers the projector box and then the screen via a remote control. Results: The church is delighted with the superb brightness and picture quality of the new projector and how easy it is to operate the motorised screen. The long throw lens and lens shift added real flexibility when siting the projector. As the projector is able to use rear projection, it was installed well above the musicians and choir and behind the screen, so is completely out of sight during church services. St John the Baptist is the parish church of Hartford, located near the town of Northwich in Cheshire. It is an evangelical Anglican church, part of the Church of England, in the Diocese of Chester. The church already had a projector and screen to help the congregation follow its services. But the projector was a small, low resolution desktop model that had to be set up for each service and the Perspex screen was extremely heavy, visually intrusive and held up by ropes attached to the church’s side walls. When not in use, this two-metre wide weighty screen had to be removed manually by three or four tall and strong people using ropes and pulleys. 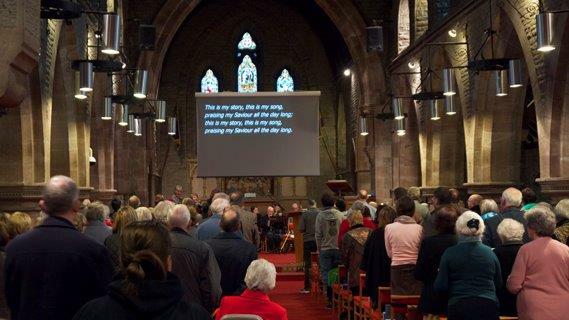 Cheshire-based events and installation company, Ambient Audio Visual, was drafted in to find an alternative solution for the church. All works had to secure approval from the Diocese of Chester to ensure the fabric of this building, built between 1873 and 1875, was protected. This approval is called a faculty in the Church of England. The church needed a new projector installed so that the image would not be obscured in any way by the musicians and choir at the front of the church. It also needed a new screen that could be deployed easily and remotely without manual handling. The placement of the screen was particularly challenging in that it needed to hang from the ceiling seven metres above. There are strict rules to install equipment in these protected buildings with all fixtures, fittings and installation needing faculty approval from the Diocese. In addition, St John’s is a Grade 2 listed building. A faculty application outlining all equipment, fixtures, fittings, wiring and installation was submitted and approved by the Diocesan Advisory Committee. Ambient Audio Visual chose Optoma’s EW865 projector due to its high resolution (WXGA), high brightness (6,000 lumens), motorised lens shift, its ability to operate 360˚ and its reliability. The dust-sealed, filter-free design prevents dust and dirt from affecting the system ensuring optimal image quality with minimal maintenance. The EW865 was also chosen because it is compatible with the BX-CTA03 long throw lens. This lens has an excellent throw ratio of 1.6 ~ 3.07, which together with the lens shift capabilities of the EW865, provided real flexibility for installation. 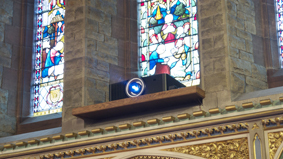 The projector was installed on an oak shelf high up, just below a stained glass window, to provide rear projection onto the 2.5-metre motorised screen. The screen box and motorised winch were installed so that they are out of sight at the top of the church’s seven metre high ceiling but, when lowered are optimally aligned at the front of the congregation. The two-stage motorised winch operates via a remote control which drops the screen box five metres using steel cables. The screen is then lowered from the screen box. Ambient Audio Visual erected scaffolding and used a pulley system to install the equipment at the top of the church. The church is delighted with how easy it is to operate its new screen and the superb picture quality of the new projector. The brightness and resolution of the EW865 ensures that even on the sunniest of days when light floods through the church’s beautiful stained glass windows, its picture remains crisp and clear. And by using rear projection with the long throw lens, the projector is out of sight during services and the musicians and choir cannot obstruct the imagery. The words for songs and hymns projected on the screen are clearer helping elderly parishioners and those with visual impairments to participate more easily in the service. Images used during talks and sermons are bright and clear making a great visual impact. When it is retracted, the screen can hardly be seen and there is no longer the need for any strenuous manual handling of the heavy Perspex screen. The project was completed in November 2013 just in time for the very busy Christmas season.